A rise in demand for composite door fabrication has lead Frame Fast UK, top trade manufacturer in the East Midlands, to invest in the latest wrapping technology. 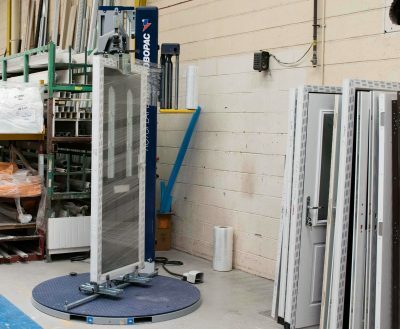 The investment in the Rotoplat DW machine was made to help factory automation as part of Frame Fast’s commitment to providing high quality composite doors with a professional appearance. Nigel Leivers, Director at Frame Fast, says: “This investment means that we can streamline our manufacturing line and deliver our composite doors, with extra protection. “After final inspection, the finished composite door is swirl wrapped in the Rotoplat DW machine, ready for delivery. We take the utmost care that our products leave our factory in exceptional condition, and are delivered to site perfectly, ready to install. Call us on 01332 344459 to discover more about our composite doors range.